The ever-animated master of ceremonies John Gardiner presides over the poet contest presentations. The Laguna Beach Library will host a public recognition of winning poets and a public reading of winning poems from the 20thannual community poetry contest at noon Saturday, June 2. The contest will be renamed the John Gardiner Community Poetry Contest in memory of John Abbot Gardiner, a local poet and poetry contest master of ceremonies. Michael Sprake from the Laguna Poetry Workshop hosts this year’s event. 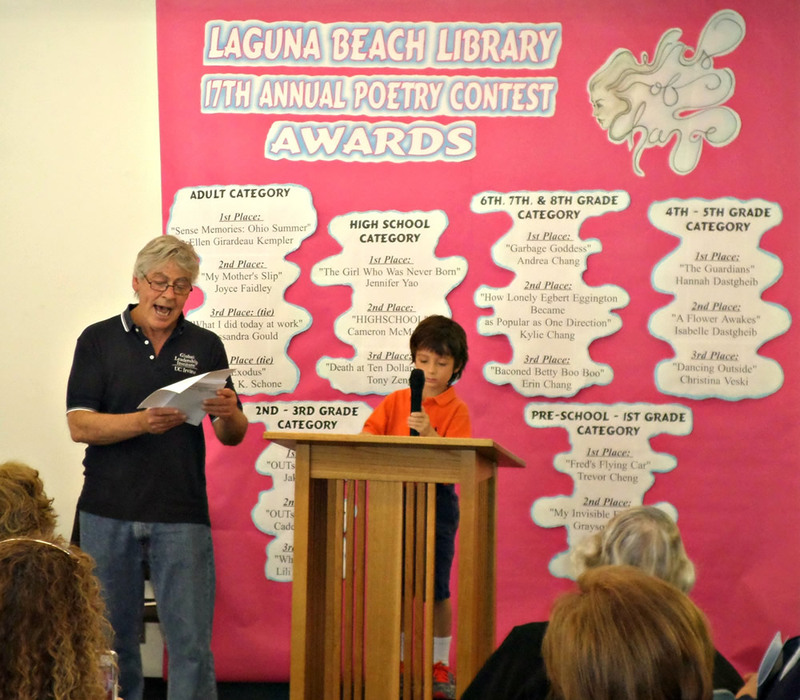 Each year, the contest is funded by the Friends of Laguna Beach Library, who provide prizes for the winning poets and who cover the printing costs of a locally produced booklet of winning poems. The friends also purchased a commemorative paving stone inscribed with Gardiner’s name, which will be placed in the library’s butterfly garden prior to the event. 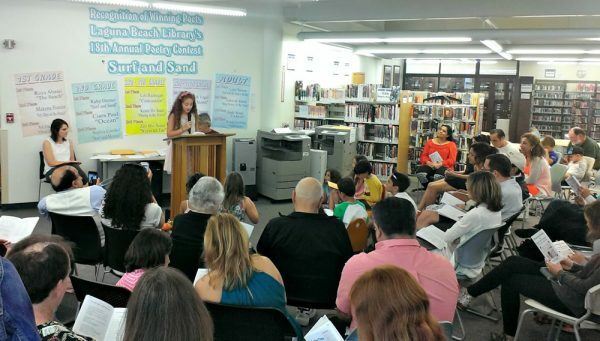 An appreciative audience listens to a poet contest winner in 2016. Preschool- 1st grade: Grayson Grzeskowiak, Kellan Gruba, Alexander Entress, Violet Shurla. Second grade: Klara Tilda Hamersley, Veronica Cai, Sophia Schaefer. Third Grade: Isabella Norelli, Theron Greengard, Caroline Talarico, Hayden Crane-Henning. Fourth-fifth grade: Jaden Chen, Zen Mir-Scaer, Keanu Mir-Scaer . Teen: Penelope Duran, Clara Becker, Logan Leeds. Adult: Daniel McGinn, Jane Gragg Lewis, MJ West, Phoenix Rose, Raundi K Moore Kondo.